Abyssal enemy, weak to Wolf Knight's Greatsword and Farron Greatsword damage. Susceptible to Vow of Silence. This boss has different resistances depending on if you hit Aldrich himself (slug-esqe thing) or Gwyndolin. "A right and proper cleric, only, he developed a habit of devouring men. He ate so many that he bloated like a drowned pig, then softened into sludge, so they stuck him in the Cathedral of the Deep. Aldrich became a lord by devouring men, but was disillusioned with his throne, and so took to devouring gods instead. 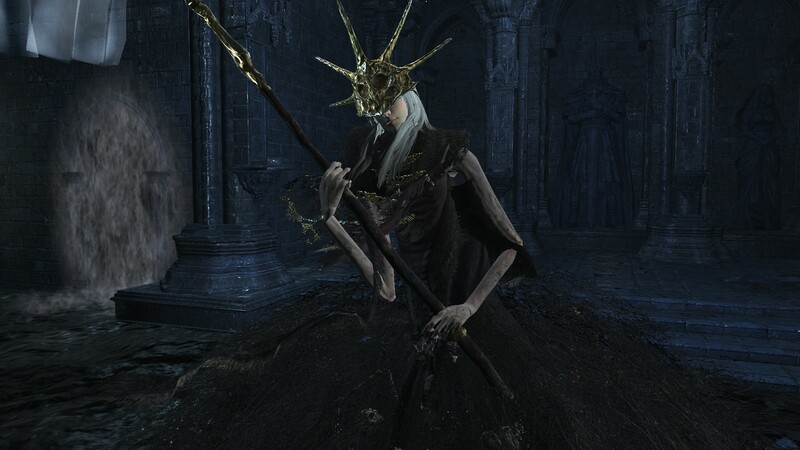 Formerly known as Aldrich, Saint of the Deep. He is a Lord of Cinder that has devoured Dark Sun Gwyndolin. Due to strong Faith and because he obtained the memories and dreams of the beings he devoured, he is able to project and re-create the Gravelord Sword, Lifehunt Scythe and other abilities using the power of Miracles. Found in Anor Londo in the old cathedral. The closest bonfire is Anor Londo. At the doorway of the Grand Cathedral you can be summoned by Anri of Astora if you've progressed her storyline. You are summoned into Aldrich's boss room to help her defeat Aldrich in her world. Her Summon Sign (used to summon you) is located near the large doors, directly under a prism stone she uses for her and Hodrick. Like being summoned by other players, this will not affect the Aldrich in your world. After defeating Aldrich, Smough's set appears in the Shrine Handmaid's store and is sold for 31,000 Souls. He will launch a powerful "Soul Spear" or "Emit Force" Magic damage beam at the player, often follows it up with another. This goes straight through pillars and other obstacles, so watch out. Almost identical to an attack Gwyndolin uses in the original Dark Souls. In phase two he may attack more than twice. Boss will begin strafing and channeling a Magic damage spell that releases many homing darkmoon sorcery arrows. Based on a similar attack Gwyndolin uses in the original Dark Souls. Boss will fire Moonlight arrows vertically into the air which will then rain down around the player. Based on a similar attack Gwyndolin uses with his bow in the original Dark Souls. In Phase one it lasts 8 seconds. Also follows a linear path in the first phase based on where Aldrich is looking. In phase two it lasts 10-12 seconds. Tracks player movements. He will periodically teleport away after player reaches melee range, by sinking into the sludge and releasing a damaging AoE in the process. Based on a similar teleporting technique Gwyndolin uses to get away from the player in the original Dark Souls. During phase two Teleport will also release Homing Darkmoon from where he telported from. Sometimes in phase two, he will slam the ground and release the AOE attack but not actually teleport. After a long windup, boss will slam down vertically, long recovery. Boss will rear back before lunging at the player with great range, very long recovery. Telegraphed by him holding his glaive horizontally. He will teleport and take on his embered form once at 70% or lower health. His attacks gain Fire damage. A harmful trail of fire now spawns around Aldrich and follows him. Different from the attack Priscilla uses in the original Dark Souls. Dodge to the side. Attack him after this due to it's long recovery. Dodge forward or to the side. Getting close to Aldrich will stop him casting more. Dodge to the side to avoid the orbs. Try to time your dodge so you don't get caught by the tail-end of his scythe. It is best to roll backwards if you don't feel confident in doing so. Run to the opposite side of the room, the volley will end before it reaches you. Do not stay near him as he casts this spell, as it does a massive amount of damage at close range. Alternatively, when the volley is telegraphed stay very close to Aldrich and run round him. Once you're sure you're out of the ark of the volley, hit him while the remaining arrows fall. Arrows can get stuck in the pillars if you are behind them. Aldrich will teleport to the opposite corner of the room, or the one furthest from the player, creating a swirling dark pool during the teleport animation. Dodge backwards to avoid it. His extreme tail end extends beyond the dark pool and can be exploited for desperate hits. Be careful of the fire igniting around Aldrich as it damages you overtime when you're standing inside of it. In this phase he will cast this several (i.e. 6+) times if you do not get close to him. Each cast is slightly quicker than your Estus chug animation, so don't try and chug through the damage especially if you got hit by one. In this phase he will release several sets of orbs continuously, so make sure you position yourself to regain stamina for dodging, otherwise you may get hit several times. Running around the pillars (broken or not) is a good way to beat the tracking of this attack. As the volley lasts longer, it is quite hard not to be hit by the tail-end of the volley if you're not careful. But it will eventually stop tracking so pay attention and get ready for a chance to attack Aldrich. Be careful of the Homing Darkmoon that now releases from every teleport. If you have a high amount of Luck and Dexterity, then this strategy is optimal. Find a Hollow Gem and pick a dexterity scaling weapon with inherent Bleed, such as the Washing Pole. Make it Hollow, and purchase some Carthus Rouge. Basically, apply the resin and simply try and proc your Bleed as much as possible. If you have a dedicated pyromancy build, maximize your fire damage then just go with Great Chaos Fire Orb or Chaos Bed Vestiges entirely for this fight. Aldrich is weak to fire and these spells destroy him easily. Co-op on this boss can be a little trickier than usual. High latency causes glitches when he teleports as sometimes the animation and actual position of the enemy won't match. The audio, however, works correctly. https://www.youtube.com/watch?v=m8v5AC0O3Zg Glass Cannon Mage Strategy using twisted wall of light to nullify Aldrich's arrow barrage.